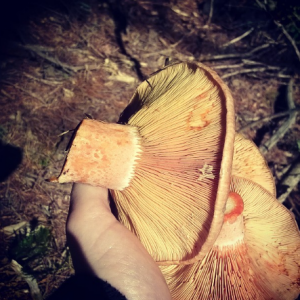 The Beechworth Food Co-op and Beechworth Urban Landcare & Sustainability Group would like to invite you to a Mushroom Forage in the Forest! The time of year means one thing to a North East resident – wild mushrooms! The forage will be guided by experienced mushroom forager Franca Norris; who learned to identify edible mushrooms from her father, a professional forager in Italy. Delicious mushroom tastes will be supplied, however coeliacs cannot be catered for. Anyone with a yeast allergy would also be at risk of mushroom allergy also and should not attend. A detailed location will be advised via email (in the forest near Beechworth where the mushrooms are sprouting), closer to the date. Strictly limited to 20 participants! Email us now at [email protected]g.au to secure your place. All participants will need to be able to walk on uneven ground and scramble over fallen trees. Hard Hats and High Vis Vests will be supplied – Gorgeous! HVP don’t want you to accidentally get felled!